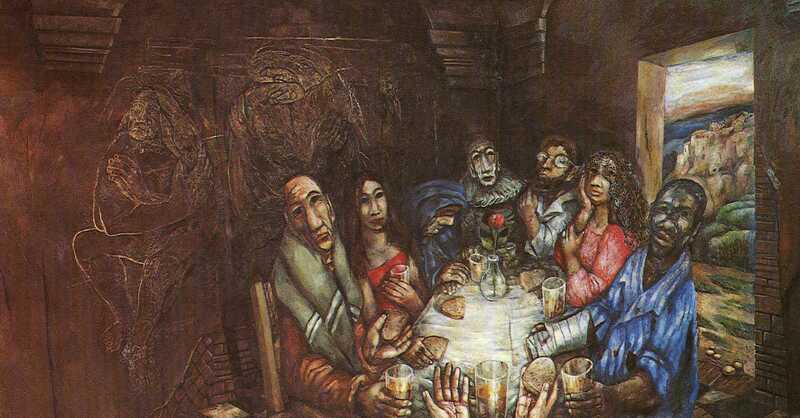 Sieger Koder is a German priest who has painted some startling folky paintings on various aspects of the ministery of Jesus. One of the features of his work is the child-like simplicty of the depicted characters and the way in some of his works that Jesus is depicted by reflection rather than actual full presence. This technique has both a hint of resurrection and a respect for the Old Testament notion of not being able to name or see the Lord. One of these images will become a feature of the easter sermons I will preach next week, but as a hint of where I might be heading, here is an image of Koders on the theme of Jesus ‘eating with tax collectors and sinners’.